About once or twice a year I get the urge to troll through eBay and see what new and interesting pens I can come up with. It is usually more of a pain to go through all of the listings than it is worth, but I did stumble upon this neat mini pen called the Uni-Ball Jumpop. The highlight of this pen is the small button near the middle of the barrel. When pressed, it snaps the pen open and exposes the 0.7mm ballpoint ink cartridge. 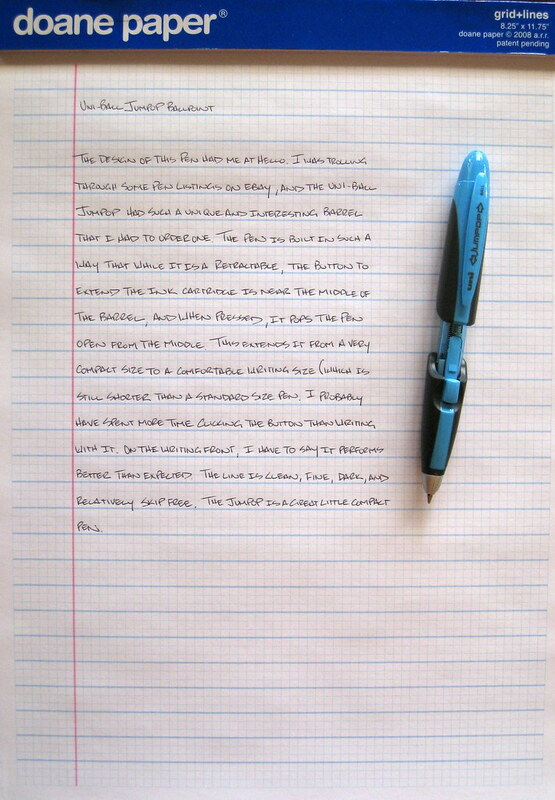 This also puts the pen into a better and more comfortable writing length. The button works so well in fact that I could hardly stop clicking it while doing the review! From a writing perspective, I am more than happy with how it performs. Sometimes with non-standard style pens, the ink is an afterthought compared to the barrel design, but the Jumpop leaves a sharp, clean black ballpoint ink line. While the ink quality isn't the same as the Jetstream, this pen feels like I am writing with an 0.5mm Jetstream refill. The compact and unique style and excellent ink performance make this a great mini pen option. Posted on March 12, 2010 by Brad Dowdy.